If you have decided to go wide and don’t want the hassle of managing individual accounts at every single retailer, or if you want to publish on Google Play right now while new accounts are frozen, you’ll use a distributor for at least some of the retail channels. Let’s talk about the three prominent options: Smashwords, Draft2Digital, and Pronoun. Caveat #3 is a doozy, so make sure to read all the way to the bottom. Smashwords and D2D have been around a long time, while Pronoun (owned by Macmillan) is the new kid on the block. I’ve used all three (though it has been several years since I used Smashwords), and I’ll compare them across three areas: channels, fees/royalties, and notes/caveats. Do not skip those caveats… there’s some big ones. Though I’m sure this will change moments from now, here’s an overview of the channels to market each distributor reaches. If one thing leaps out of that table, it’s that Pronoun has opened up Amazon as a channel. Historically, going wide with Smashwords or D2D was always a hybrid approach. Assuming you wanted to publish to Amazon (and you did), you used Amazon’s KDP to publish to Amazon, and Smashwords / D2D to publish everywhere else. Going back to Part II on file types, you had a MOBI file for KDP and an EPUB file for Smashwords / D2D. But there’s more! Pronoun not only publishes to Amazon, but it pays 70% royalties on Amazon ebooks priced under $2.99. SAY WHAT?!? More on this in the notes and caveats. For now I’ll say that this 70% royalties on $0.99 ebooks is driving a lot of the buzz around Pronoun among the authors I know. Let’s start with Smashwords. Unlike D2D and Pronoun, Smashwords is also a retail channel itself. It pays an 85% royalty on sales directly through Smashwords retail presence. For other retailers, Smashwords generally takes a 10% cut of the retail price, or a little under 15% of the royalty paid by the retailer. You can find lots of details in the Smashwords FAQ. Let’s break it out with an example. If you publish directly to Kobo, you’ll make 70% royalties (normally… see the guide for the details). If you publish through Smashwords, you’ll be paid 60%, so Smashwords took a 10% cut of the sales price, or 14.3% of the royalties generated by the sale at Kobo. To spell it out, if you sell a book through Smashwords on Kobo for $5.00, here’s how it breaks out. Draft2Digital offers essentially the same deal, though it doesn’t serve as an independent retail channel. Of note, however, D2D offers direct deposit, so you won’t get hit with additional processing fees when you are paid. Smashwords and Pronoun use Paypal for payments. Continuing with the fees and royalties, next up is Pronoun, who says, “Fees? We don’t need no stinkin’ fees!” Pronoun charges NO FEES. The retailers pay a royalty, and that royalty flows through to you, the author (minus any payment fees from Paypal). This “no fees” approach has a lot of authors simultaneously fascinated and suspicious. How can a no-fee approach prove sustainable? Where’s the money coming from to keep Pronoun going? It’s like that old SNL skit about the bank that just makes change. How do we make money? Volume! I can’t explain it, but Pronoun does not currently charge any fees. And to repeat, authors earn 70% royalties on Amazon through Pronoun (with no additional fees) for ebooks priced under $2.99. That’s versus Amazon’s normal 35% royalty on low-priced books. 1) Let’s talk about it one more time. 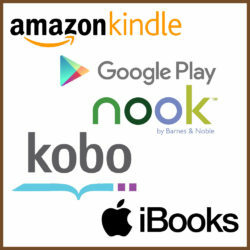 Amazon KDP pays 70% for ebooks priced between $2.99 and $9.99 (minus a minor distribution fee). Outside of that range, KDP pays a 35% royalty. It is a big deal if Pronoun pulls off a sustainable 70% royalty on Amazon-listed books priced under $2.99. 2) I don’t care for the user experience on Smashwords. D2D and Pronoun are both superb, modern websites with a well-executed book-publishing process. 3) DO NOT USE PRONOUN TO SELL ON AMAZON FOR A SERIES or if you intend to use AMS (Amazon Marketing Services). AMS is off-limits for books not published through KDP. Also, you cannot get a series page for the various books in a series unless they are all published through KDP. Well, I believe that’s the case from what I’ve heard. I know for a fact through direct experience (and conversations with both Pronoun and KDP support), that you cannot create a series page for a second-in-the-series book published through Pronoun with a first-in-the-series book published through KDP. I believe for us indie authors, the prohibition is broadly KDP-or-nothing if you want a series page, and you want a series page. 4) I’ve seen complaints of delayed sales reporting for Amazon on Pronoun. Addendum. In the comments, author Richard Houston provides further information. “I’d like to add to number 4 under notes and caveats. I have two books on Pronoun that are published on Amazon. Pronoun has not reported a single sale from Amazon. They have reported sales from Barnes and Noble, but nowhere else. However, the sales rank of one of those books on Amazon is in the 60K range, which means it has been selling 2 to 3 books a day.” Addendum 2. Richard Houston has reported that the sales are now rolling in via Pronoun, so apparently it was a delay, not a failure. 5) Pronoun provides superb data for Amazon sales categories and pricing. Even if you don’t publish with them, set up and account and start the publishing process for a book (just don’t finalize it) so you have access to the reports. This post is getting long, so I’ll stop here and kick it to the comments. If I see some questions that need addressing, I’ll return to the topic in Part V.
Thanks, Jay. I’m sure this answers a lot of questions people have been asking about Pronoun. I’d like to add to number 4 under notes and caveats. I have two books on Pronoun that are published on Amazon. Pronoun has not reported a single sale from Amazon. They have reported sales from Barnes and Noble, but nowhere else. However, the sales rank of one of those books on Amazon is in the 60K range, which means it has been selling 2 to 3 books a day. Thanks, Richard. I’ve copied your comment (with credit) up into the body of the post to make sure people see it. Let us know if there’s some resolution in a week or two.